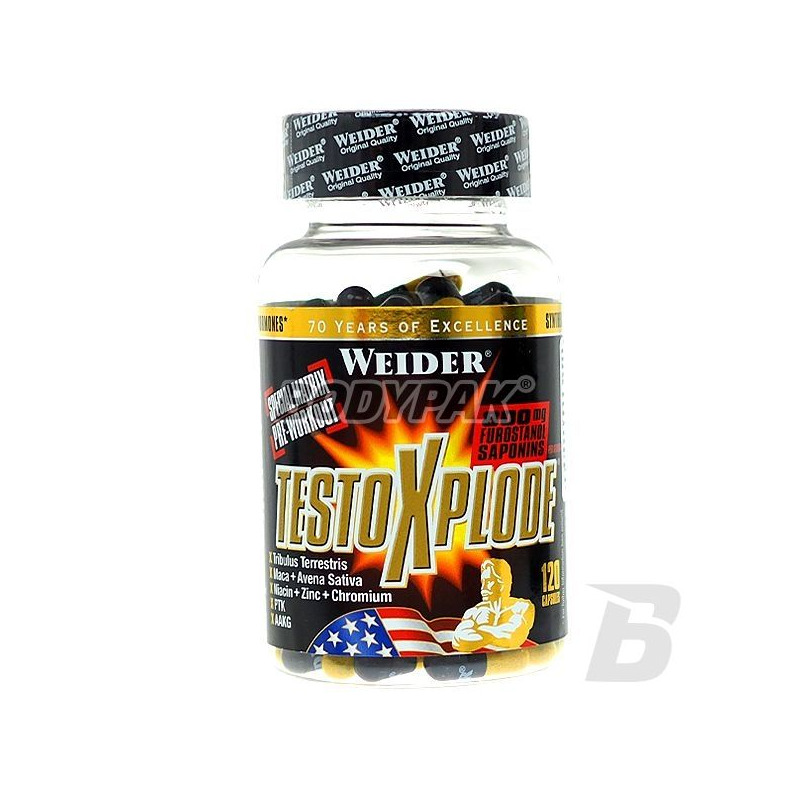 Testosterone BoostersWeider Testo X-Plode - 120 kaps. 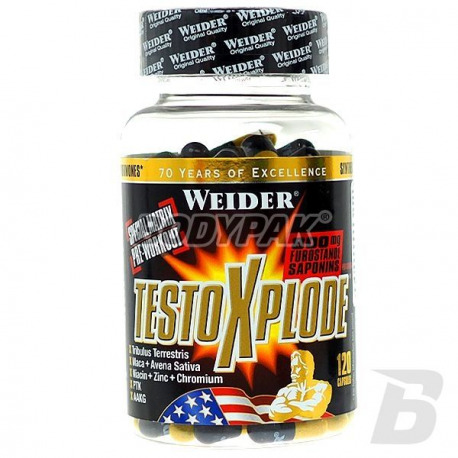 Advanced supplement aimed at supporting the natural production of testosterone. High efficiency without side effects! Bet on the quality! The new, stronger version of PTK. Preparation containing components with strong proanabolicznym action. Dietary supplement dedicated to men. Advanced composition extract of Tribulus (Tribulus terrestris L.), arginine, an extract of oats, maca, alginic acid, zinc, vitamin B3 and chrome - as you can see based solely on the effective and safe ingredients. The saponins present in the preparation to increase testosterone levels and libido increase the effect to improve the sport performance. You speed up the process of regeneration after training! Składniki: ekstrakt z Tribulus Terrestris (zawiera 80% saponin), Alfa-ketglutaran argininy, żelatyna, Ekstrakt z Avana eativa, Maca w proszku, glukonian cynku, substancja przeciwzbrylająca: sole magnezowe kwasów tłuszczowych, niacyna, kwas alginowy, chlorek III chromu, kwas pantotenowy, barwniki (E104*, E171, E172). * może mieć szkodliwy wpływ na aktywność i skupienie uwagi u dzieci. Testo jakby w górę, libido i ogólne samopoczucie na spory plus.